Our bountiful feast this year! We have much to be thankful for. It is the end of November and the holiday season has wreaked havoc on my blogging ambitions. I wanted to share a few images of our Thanksgiving this year. Last year, I was busy making mini pumpkin pies for the preschool feast and this year all I managed was canned cranberry sauce. 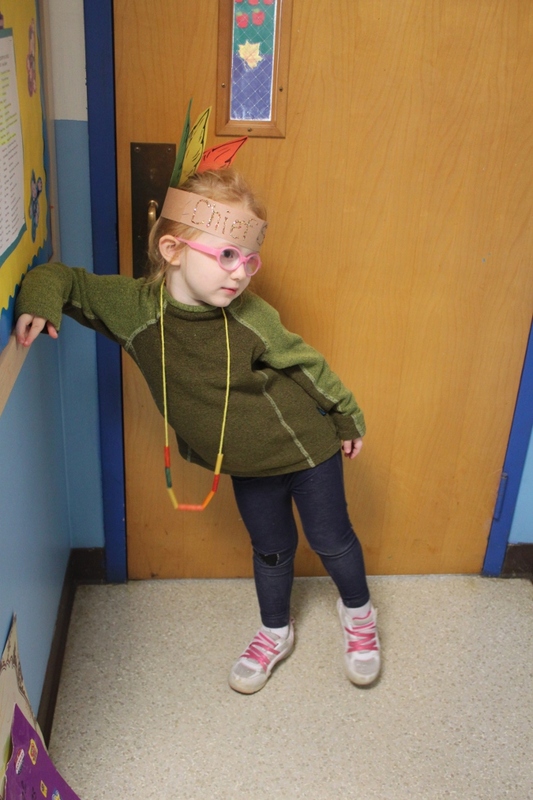 My daughter made an excellent “Chief” however. Nature is busy at this time too. 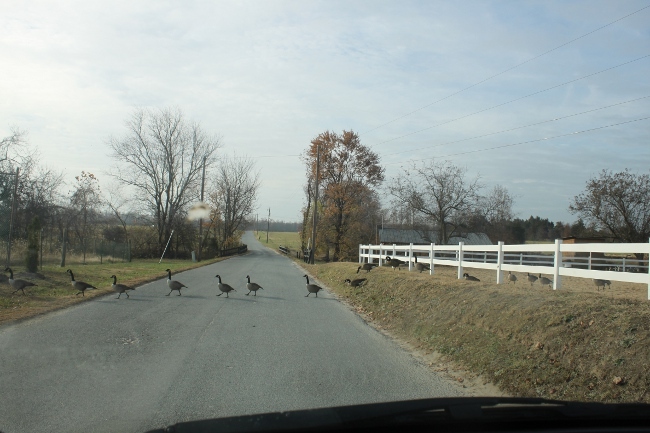 These geese crossed the road in front of my car in an impressively lengthy procession. For the big turkey day, we were fortunate to have Ruly Ruth and her family come visit. The cousins had a terrific time hanging out together and Ruth and I pulled together a great meal. We kept things simple this year. 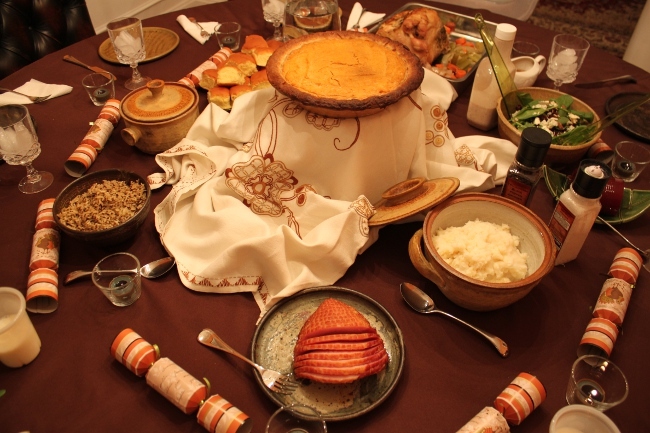 The only big things to make were the turkey and sweet potato pie for dessert. The rest of the sides were simple heat-and-eat types of things that were more kid-friendly for our group but they were no less delicious. 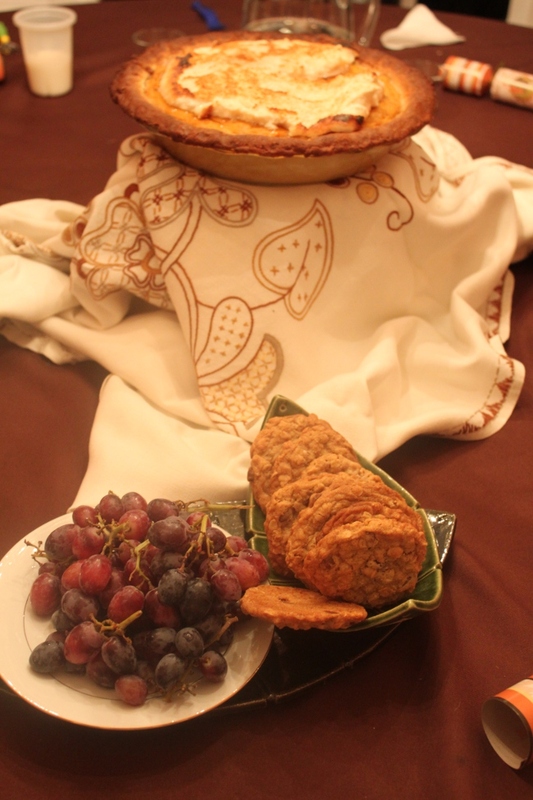 We also repeated the White House sweet potato pie recipe from last year. The pie didn’t go quite as well as last year. It came out OK but the flavors weren’t quite as wonderful as I remembered. Either I did something wrong or this is just an example of how novelty heightens our senses. To make things elegant and as a wonderful reminder of the family who can’t be with us, we served the dinner on my grandmother’s pottery plates and serving dishes and used my other grandmother’s glassware and hand-embroidered linens. It makes such a difference to have handmade or vintage family things at a traditional and important meal like Thanksgiving. I also like to add some small votive candles for atmosphere. 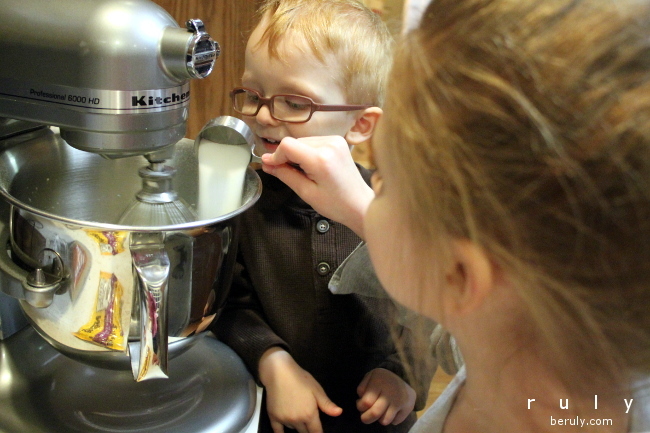 Ruly Ruth added Thanksgiving “crackers” borrowing a British tradition. We all had fun wearing our paper hats and reciting the silly jokes inside. 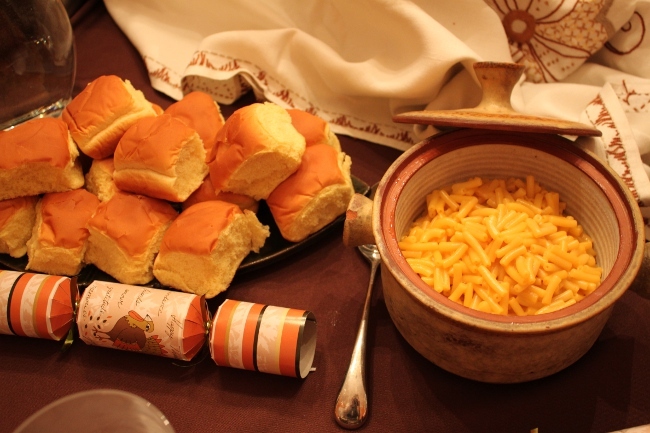 The Thanksgiving crackers were a fun addition to the table. My nephew downed all of those rolls but informed me they would have been even better if they were Hawaiian rolls. A couple of fun planning tips to share. This year and last year, I decided to cook only a turkey breast and not a whole turkey. I was worried that it would not be enough to feed 9 people but it was more than sufficient. 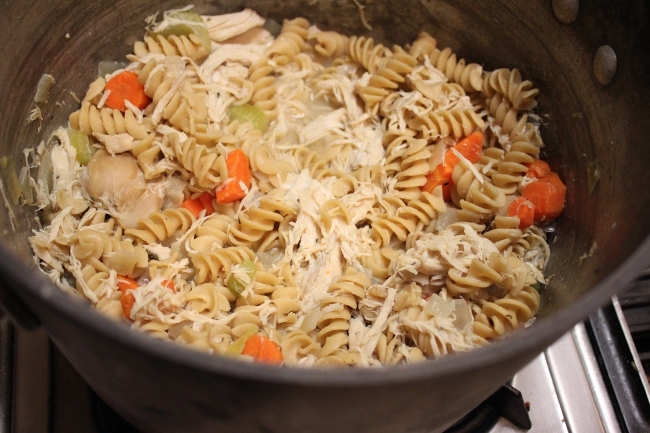 Everyone could eat as much as they wanted and the leftovers were used up in their entirety the next day in a delicious turkey noodle soup Ruth made. 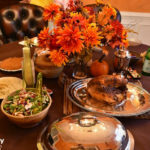 Marketplace Money recently featured a story about how much turkey is wasted on Thanksgiving and serving parts of a turkey (drumsticks, the breast, wings, etc.) 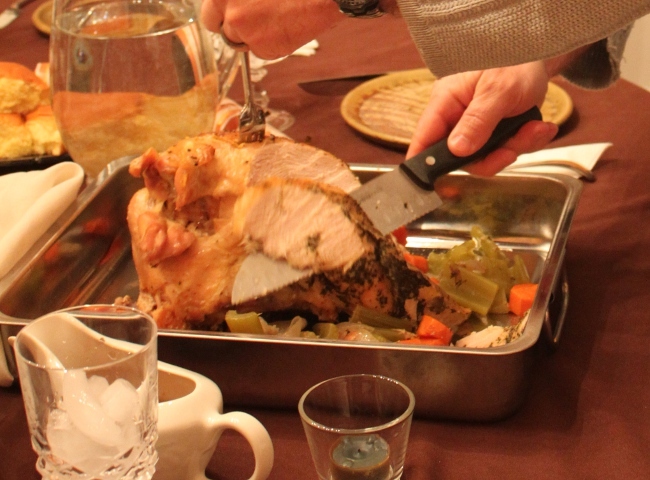 instead of the whole turkey is one way to both save money and reduce waste. Turkey soup from the leftovers. Delicious! Another great tip learned this year….if you are eating later in the day and you need to figure out how to feed everyone lunch so they are not starving by the time the big meal starts or have something ready for guests who might pop in, break out the Crockpot! Ruth made this simple but flavorful and delicious tortilla soup that was light but filling. 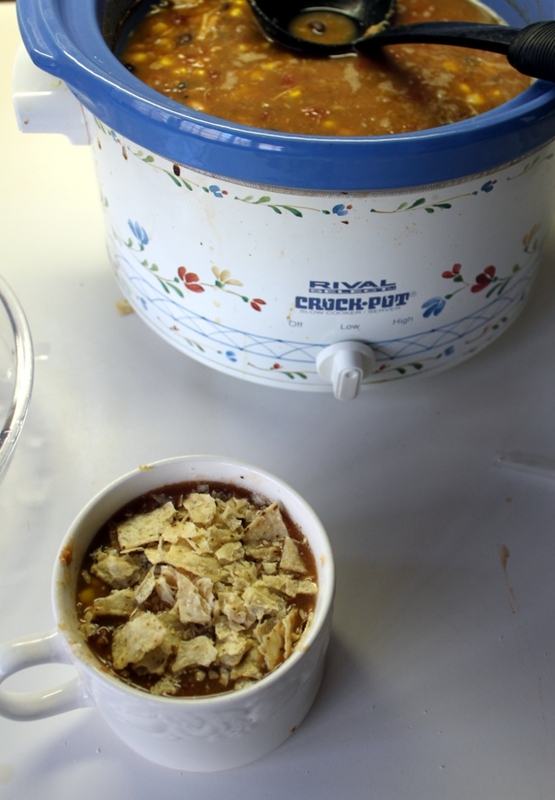 Crockpot tortilla soup was a great pre-Thanksgiving snack/meal. Overall, it was an enjoyable and relatively low-stress holiday! Cheers to my sister for making the trip! I hope your celebration was wonderful as well. 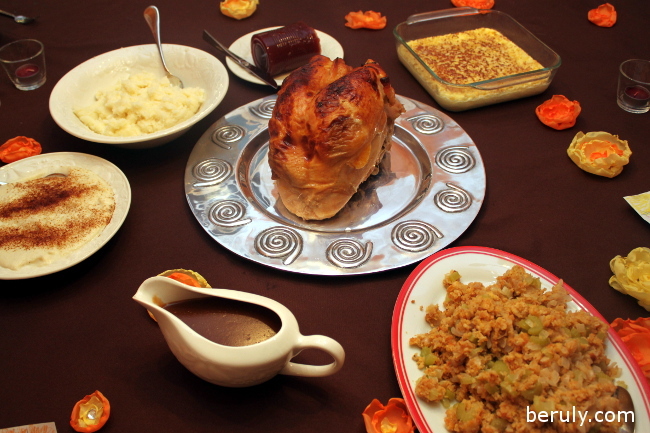 Have any Thanksgiving recipes or stories to share? Please share in the comments.